What does Faqeer mean, details, origin, short & easy attributes? Faqeer is baby boy name mainly popular in Muslim religion and its main origin is Arabic. Faqeer name meanings is Poor Sufi Mendicant. Faqeer is written in Urdu, Hindi, Arabic, Bangla as فقیر, फ़क़ीर, فقیر,فقير, ফকীর. Other similar sounding names can be Faqeed, Faqeeh, Faqih, Faqiih, Faqir, Faqiha, Faqirah. Popular personalities with Faqeer Name. 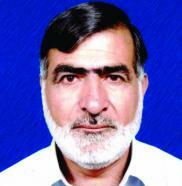 Faqeer Muhammad Soomro is a writer and columnist. Faqeer was born on March 1st, 1955 in Hingorja (Community).